And that leads to many historical articles (e.g., ones in the NYTimes or the local online newspaper, Palo Alto Online) where you’ll find that it began as a roadside stop between downtown Palo Alto and Mountain View. 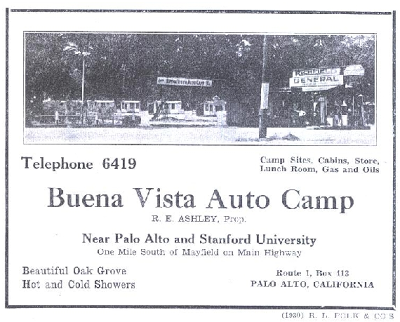 It started up in 1926 as a tourist camp, with simple, small cabins arriving later, along with a café (“Chat and Chew”). Now, to find the ages / ethnicities of the residents of the BVMHP. you can find a number of different demographics data suppliers. But after poking around for a while, I found that most of them just provide aggregate data for the entire city. What I really wanted was the ability to drill down into that particular neighborhood. 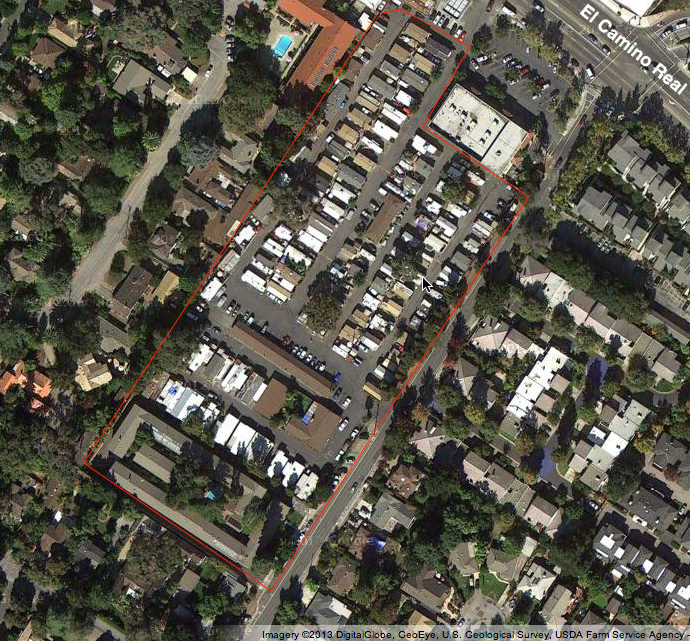 By following the link to City-Data.com for Palo Alto http://www.city-data.com/city/Palo-Alto-California.html – you’ll find a link to the Barron Park neighborhood, which produces a ton of data that they’ve collected from a number of sources. I also found that I could do a search on the street address of BVMHP at 411.com and get a pretty complete listing of people living in the park. By just scrolling through the list of names and ages, you can quickly see that the trailer park is around 75% Hispanic (Martinez, Valdez, Montes, Robles, Ramirez, etc…) with a decidedly older tendency than for the rest of Palo Alto (I counted ~25% older residents). I could have dropped all the data into a spreadsheet and done a pretty accurate count, but this was sufficient for our purposes. At the bottom of that first article is a link to the historyof the place, which actually tells the story about the “Chat and Chew” and the cost of doughnuts. But suppose you didn’t see that. How would you search? Also notice that I did NOT use “per dozen.” Why not? I actually tried that first, and didn’t get anything. So I went for the more generic phrase, “for * dozen” thinking that would include any probable rewrite. And I was right. In 1932 at the “Chat and Chew” you could get a dozen doughnuts for $0.35 / dozen, just under 3¢ each. Those were simpler, or at least cheaper, times. Search lessons: As I mentioned in my 1MM last week, sometimes you really need another tool—in this case, a database that has the information you need within. By first finding the proper name of the place, then using that to reverse-find on the address with a special tool (in this case, 411.com and City-Data.com) we’re able to learn a lot of otherwise unfindable information. But now you know how! 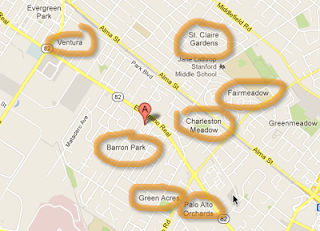 Wednesday search challenge (1/30/13): Who lives here? Not far from where I live there’s a trailer park that’s at the roiling center of a local controversy. It’s located on El Camino Real (in Palo Alto, CA), a bustling street with high property values in a residential neighborhood at the heart of Silicon Valley. Now, of course, a developer is considering developing it for other purposes. The controversy is about whether or not this is about maximizing property values by displacing people who don’t have a strong voice in city politics. Suppose you’re an investigative reporter trying to figure out a bit of the backstory here. A few questions would spring immediately to mind. And these questions are this week’s search challenge. It's not immediately obvious how you might search these out, but I hope you'll find a way. Tune in tomorrow for the story of how I did it. (2) What’s the history of the place? How long has it been there? When did it start? (3) For extra credit: How much were a dozen doughnuts at the café in the first few years after it was established??? Sometimes just searching for an answer doesn't quite solve the problem you're working on at the moment. For instance, remember the Wailea beach sunrise challenge? That involved working out some basic trig to compute the angles for the sunrise. Search for a tool to do your complex tasks for you. In the Wailea beach challenge, I should have realized that someone would have built a tool to compute the angles and sides of a right triangle. This "search for a tool" idea is such an important notion that I made a 1MM video for it. The thing to take away from this is that MANY keywords can be used to find tools of various kinds. In this 1MM I mention terms like calculator app and generator. But I'm curious what search terms YOU use to find tools. Post your favorite examples in the comments below! Answer: What, why, and where are these stone circles? Quick answer: The brick circles show the outlines of underground cisterns of water that can be used to fight fires even when the city’s regular water supply is broken. First, I’m impressed that so many people recognized San Francisco, the City by the Bay, from the pictures I showed. I guess it’s not a completely wild guess, given where I work and those hills in the background, but still—that’s impressive deduction! There are a number of sources that give various versions of the answer. Let’s talk about those versions for a moment. The circles mark cisterns for emergency fire-fighting water supplies that were put in place after the great 1906 earthquake and fire that destroyed most of the city. The SF fire department claims there are 172 cisterns on this page – but in other SFFD pages, they say the number of cisterns is 177. Go figure. I imagine there’s a master map someplace with all of the cisterns (see below), but bear in mind that the city is building more cisterns even now (see the Fire Commission meeting minutes from 2011 ) so the number COULD be varying! Are the cisterns pressurized? Many readers gave solutions that commented on the cisterns being pressurized. They could be, but keeping large underground tanks pressurized for more than 100 years would be an engineering challenge. 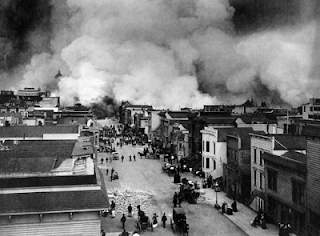 (Especially in a place like San Francisco, which has its fair share of earthquakes.) What’s more, since the cisterns were built in response to the great earthquake and fire of 1906, the engineers realized that they couldn’t rely on having power or intact water lines throughout the entire city. 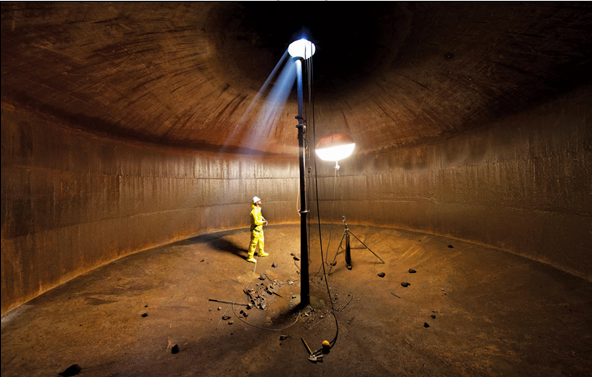 This led to the design of the cisterns as more-or-less stand-alone reservoirs. As this page from the SF fire department illustrates, there are actually 4 different water supplies for fire fighting in San Francisco. (1) The high pressure system (most US cities have this—it supplies the ordinary fire hydrants at curb-side). (2) The low pressure system just taps into regular drinking water supply—these hydrants are all white. (3) Sea water system. There are 52 suction connections along the northeastern waterfront that allow fire engines to pump water directly from the Bay. Both city-owned fire boats can also supply saltwater to the system by pumping into any of five manifolds. (4) Cisterns—these are the big tanks of water (usually around 75,000 gallons each) that are under key street intersections. They are unpressurized, but the water can be pumped out through the green-topped hydrants. 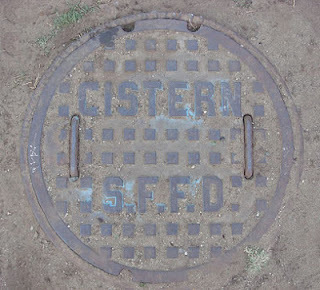 On the site SFFD says “…the cisterns have no connection to either the Water Department or high pressure supply system. They are under continual inspection by the Fire Department and are kept full by the Bureau of Engineering and Water Supply.” That is, they go around every so often and pour water in them, usually from the low-pressure system. 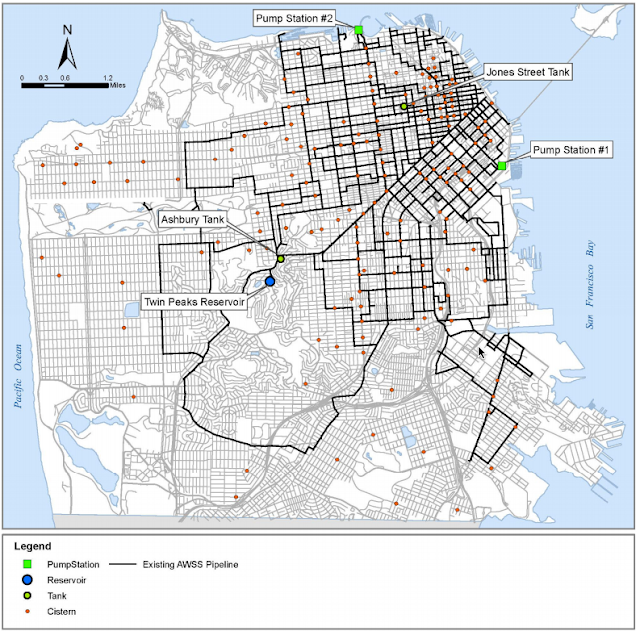 San Francisco fire fighting water supply map showing the cistern locations as red dots. From SFgov2.org report on the Auxiliary Water Supply System Study, January 23, 2009. And.... Don’t assume you know the answer just because it seems obvious. The circles are NOT cable car turnarounds. This is an example of jumping to a conclusion due to priming. Because San Francisco is well-known, and well-known for cable cars, the conclusion that these circles are cable car turnarounds seems obvious—but remember to check your work! Post script: Regular reader Carolyn sends in this note: "I found a photograph of one of the San Francisco cisterns, taken during the ongoing auxiliary water supply upgrade. This photo won a place among Engineering News-Record's 2012 Year in Construction best photos." So that's what they look like from the inside! Wednesday search challenge (1/23/13): What, why, where are these stone circles? I was walking the other day and came across part of a fragment of a stone circle embedded in the street. 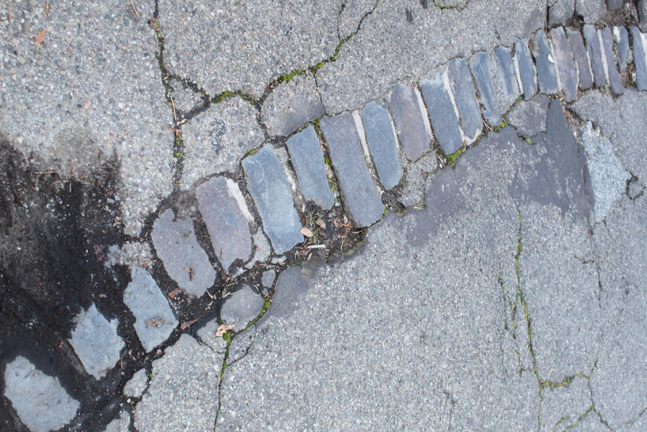 That was odd, but I didn’t think much of it until a little while later I happened to come across a full circle, also laid perfectly in the street, made entirely of bricks. Once is odd, but twice makes me pay attention. When it happened a THIRD time, I started wondering why the city would be making such interesting marks on the pavement. Is this the rise of a new Stonehenge culture? Could it be the mason’s version of crop circles? Maybe they're secret ICBM missile silos! Today’s challenge: What are these circles? Why and when were they made? How many more can I expect to find? Finally, in what city do these circles appear? As always, please let us know what the answer is, and most importantly, HOW YOU SOLVED the challenge! If you’d include a time estimate on how long it took, that would be great too. Answer: What's the story of the yellow guy? Answer: When will the sun hit the beach?